What is the Minimum Monthly Budget you will take? we give you, you haggle 75% lower. We don't set or control the "baseline"
of days per week of saturation, and you have the budget. I want to be able to pick the exact stations my business will air on. How do I do that with your system? on a specific station,then you should not use our auction. Am I receiving a guaranteed clearance % ? if you pay additional money to the station for them to insert a "non-preemptable rate code" on each commercial. a graph showing how clearance fluctuates from month-to-month, please request it from one of our Team Members. each lunch, etc. Do you have a local office or local rep in my city I can sit down with? excess inventory. 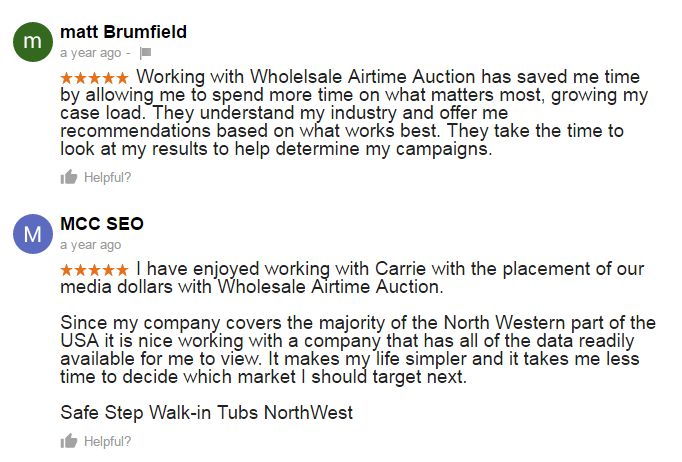 And the first stations that accept your CPM bids get your budget (up to your total max budget amount). Do you have foreign employees? I don’t like to do business with foreigners. I have bought TV and radio advertising for years. And the stations all give me Net 30 payment terms. I won’t do business with your company unless you give me the same terms. We understand that this is how it has worked in the TV/radio advertising sphere for 50 years. And if we were an advertising agency or a station, we would offer the same thing. 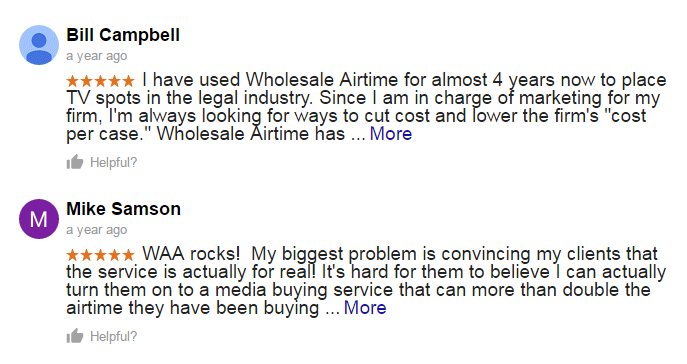 But the fact is: we are an auction service, that offers TV and radio airtime. And no auction service in the world (at least that we know if) can give payment terms. In life and business you usually can’t “have your cake and eat it too.” The majority of businesses that work with us get tremendous savings by working in our auction. But in order to get the savings and in order for stations to accept the bids at such low auction rates, they demand CIA (cash in advance). It is not different than naming our own price on Price**line (which is great company). You can’t “pay at the hotel” when you use their super discount service. I understand why you need immediate payment for auction services. But I am concerned that you guys will scam me and just take my money. If you are somebody who is old-school, and you never buy anything online or work with any type of virtual/national businesses, then you probably should not take your first dive into this world with us. I could not convince my grandma buy something on Ebay and there is no way she would understand an online, wholesale airtime auction ???? #2 We have numerous good Reviews on Google, and our ratio of good reviews to poor reviews is 92% (counting letters of reference). #4 If at any point you are unhappy with our service, and you feel like you have exhausted all avenues trying to solve the problem directly with us, you are welcome to request a neutral 3rd party Mediator. And since it is our goal to resolve as many client issues as possible, we agree to pay for 60% of the mediation expense. Important Note: should we have a grievance against a client, we also agree to request Mediation with said client before filing any District/Federal lawsuit against them. #5 We have been in business since 2007. And when Google TV, Google Radio, and Bid4Spots went out of business, we persevered. Clever fly-by-night type contractors or businesses can get away with their scams for a few months or maybe even a couple of years, but not 10+years. Do I get guarantee of the amount of lead/sales/revenue I will receive when I purchase an advertising campaign through your auction? TV and radio media buying is considered a moderately advanced skill in the overall advertising paradigm. And if you are asking this question, you must have never purchased any kind of advertising before. Therefore, it would probably be best if you went out and purchased some basic Internet advertising and got comfortable with advertising in general, before jumping into our radio and TV media buying auction. Do you accept company checks or credit cards? Our clients spend anywhere from $10,000-$500,000. And like many businesses who have very large average ticket purchases we can’t accept credit cards. We do accept company checks (with normal banking verification criteria) and bank wires. We also provide free Fedex labels for overnighting your company checks to us. How do you get paid? What % of agency commission do you charge us. We are not an advertising agency, we are an auction and a wholesaler. 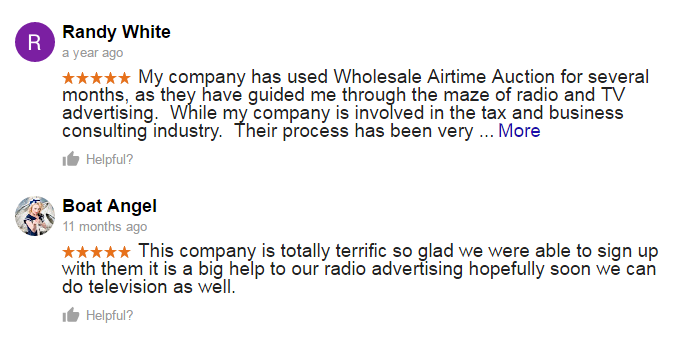 Therefore, we are not paid an agency commission by the stations and we do not charge you one. The CPM prices you bid in the auction is the price you pay, up to your max budget amount. Is this just crap remnant inventory, which will all air at 3AM? Our auction inventory is not classified as remnant, D/R, etc. It is simply normal inventory for timeframes our clients choose to bid on. And the only way your inventory will air at 3AM is if you bid on the 12M-6AM graveyard timeframe. I really don’t know if my product is going to work via TV/radio advertising. If it is not working after the first few days/weeks can I just call/email you and cancel it? Our new Order Packs all have reasonable cancellation provisions. However, you cannot just stomp your foot and cancel them when you demand. If your business is in such financial turmoil that you might need to cancel a campaign in a few days/weeks, then we recommend you do not purchase broadcast media from anyone. My lawyer wants to change some of the language and clauses in your Order Pack contracts. Is this possible? We are truly looking for long-term client relationships. Therefore, we understand that compromise is necessary in any two-way business relationship. So for businesses that are placing multi-month orders this is definitely possible. Our company policy is that any requested contract changes must be sent to one of our outside law firms. Our law firm can work directly with your law firm to see if both parties can come up with a compromise which makes both parties comfortable. Note: if you decide you need to explore this, please start the process AT LEAST four weeks before you need your commercials to be on the air. Lawyers work slow, and ours are no exception. How come I’m going to pay for all the incorrect and pre-empted spots in advance, but then I have to wait 45+ days until I can use the small amount of pre-empted inventory again? Why can’t you just refund this money? 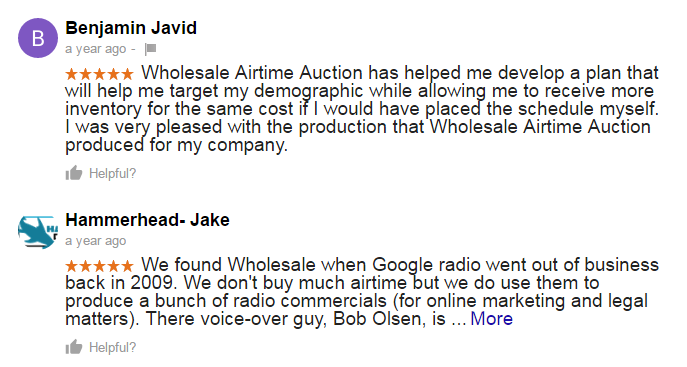 We are an auction company first, and a media company second. And like with any auction company in the U.S., refunds and cancellations don’t exist. In addition to this, part of the reason the stations agree to accept these bulk cash offers for 2-50 cents on the dollar is because it is guaranteed cash for them. 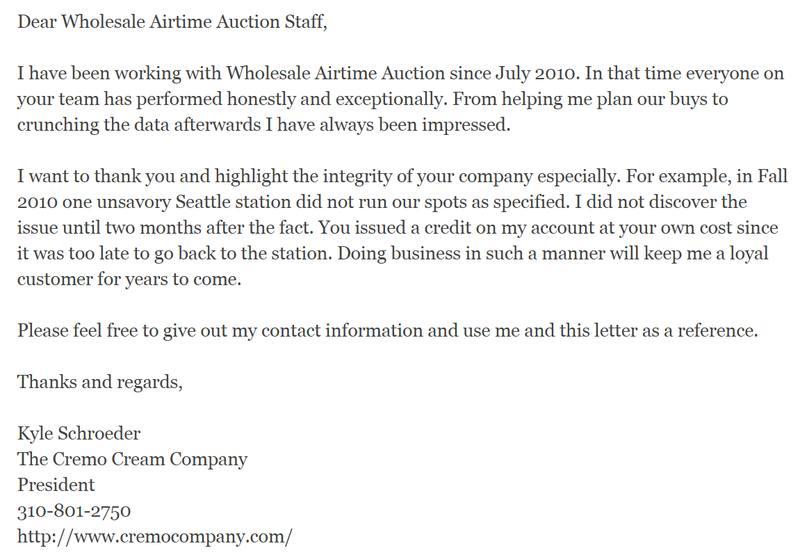 If we did not wire them immediate Cash in Advance when they accepted your auction bids, or if we told them we wanted immediate refunds for pre-empted commercials (with no chance for them to makegood the inventory), we would be out of business. The only way it works for their business model or our business model is if they can guarantee they have sold this block at XYZ discount, and forget about it. Like with most things in life: you can’t have your cake and eat it too. If you want normal refund/cancellation flexibility for your media purchases then you have to go pay normal media rates. Our clearance rates are awesome compared to what normal D/R or remnant companies provide, but it is not possible to give 100% clearance “in flight” (as explained in another question above).